Need recreation? There is always something fun to do in Stayton's Parks! Find out about all upcoming City events! Looking for a good book? Visit the Stayton Public Library! Learn more about the history of Stayton! Would you like to serve your community? Volunteer! The City of Stayton is located 14 miles southeast of Salem, along Highway 22. Stayton was established in 1872, and incorporated in 1891. Located along the North Santiam River, Stayton is a regional agricultural and light manufacturing center. 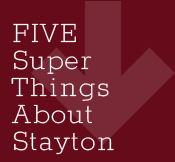 On this site, you will find information about Stayton's city government, our administration, services, and recreation. Notices of upcoming city meetings can be found on our City Meetings Calendar. Also available are minutes from recent meetings of the City Council, Planning Commission and other boards and committees. Additionally, various City documents including our Municipal Code and Newsletters can be found by visiting our Document Center on the menu above. Select a highlighted date to see events.